Backwaters Canoe and Kayak Hire01873 831825work CanoeingCanoe and Kayak hire from Backwaters Adventure Equipment Ltd.
Travelling by canoe or kayak is a wonderful way to explore the countryside. Moving peacefully along river or canal, you can watch wildlife or just enjoy the scenery, often in locations that cannot be reached on foot. If you really want to get away from it all, a canoe-camping trip can be an inexpensive and unforgettable holiday. 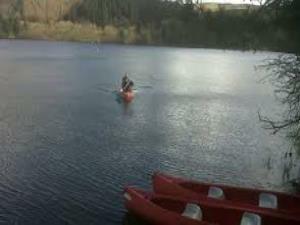 Backwaters offers canoe and kayak hire in Wales and the Border regions. Extended hire is available on all the waterways we cover. If you do not have camping equipment, we can supply your canoe with tent, stove/fuel, sleeping mat and bag, and containers to pack it all in. Open Cockpit Kayak. These are suitable for those who want to cover distances without going onto rough water. No capsize drill is needed, as in the event of a capsize you will fall out of the kayak. These are ideal for those who want to be ON the water, not in it. We have day kayaks and touring kayaks with a watertight compartment for equipment. Open Canoe. The open canoe is also ideal for those who want to stay dry, but it is a more versatile craft. With its large carrying capacity this is the craft for exploring well off the beaten track, or for family picnics. Closed-Cockpit Kayak. These kayaks have relatively tight-fitting cockpits sealed with spraydecks to keep out the water, and are ideal for white-water or sea touring. To use one of these it is necessary to have practised the capsize drill, to exit the kayak safely underwater. They have limited capacity for carrying gear, so are more suitable for day trips. If you are a complete beginner, or a parent with young children, the Monmouthshire and Brecon Canal offers placid and sheltered water, and with a towpath along the entire length, you can stop for a break whenever you want to! The Monmouthshire & Brecon Canal offers 50 km of placid water canoe touring, mostly without locks (except at Brynich and Llangynidr), combining spectacular scenery with historical interest, particularly for those with an interest in 19th Century Industrial Archaeology. As the flow is minimal, a return trip is possible on this waterway. The River Wye is more challenging, with fast-flowing sections, bends and one or two larger rapids and weirs. There are long sections where it is not possible to land, so you will need to be more self-sufficient, but it offers the opportunity to 'get right off the beaten track'. The River Wye offers 100 miles of canoe touring, mostly on grade I-II water. Places of interest en route include Hay on Wye ‘booktown’, Hereford Cathedral and the Symonds Yat Gorge. If you would like to tour on the River Wye, but are not sure whether you have the necessary experience, our 'River Awareness Day' will give you the basics of risk assessment, hazard recognition and strategies for safe paddling. 'River Awareness Day' can be booked as a stand alone day. It can also be taken as the first day of an extended tour, in which case the guide leaves the river at the end of the first day leaving you to enjoy your holiday as a self-sufficient group. Camping Equipment from £10 per person per day.